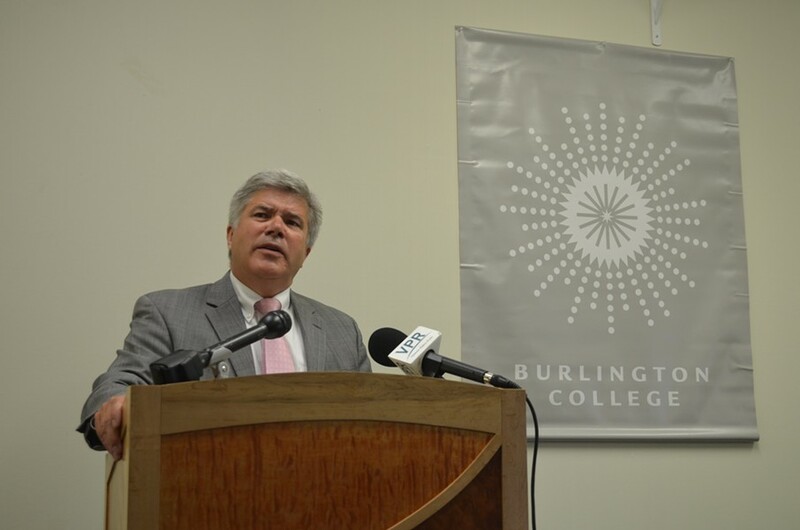 Michael Smith addresses students, staff and reporters at a press conference at Burlington College last week. It didn't take long for the interim president of Burlington College to hatch a plan to save the school. For now, it hinges on one thing: cash. Sitting in his new corner office at the college's North Avenue campus on Wednesday afternoon, Michael Smith summarized his challenge: "What I need to do is figure out a way to give this organization some breathing room because when you're going crisis to crisis, you’re only planning for that crisis ... How do I do that?" Smith, who took over the position less than two weeks ago after Christine Plunkett resigned unexpectedly amidst a student protest, proceeded to answer his own question. "I ask for money. It’s as simple as that." It does sound pretty obvious, but it's also a reversal of the college's stance up until this point. After the regional accreditation group put Burlington College on probation in late June, the college administration said it was putting fundraising on hold because, as board chairman Yves Bradley put it then, "The time to come to them is not when you are down and need a Band-Aid." Asked to explain the turnaround, Smith responded, "I think we’re past that." Smith is a former state president of FairPoint Communications and secretary of human services. The board recruited him — along with Jane Knodell, a city councilor and a University of Vermont professor; and David Coates, a prominent Colchester businessman — to help the floundering college. Smith is serving as president through December. What is Smith's sales pitch to potential donors? It's also pretty simple. "If the continuation of Burlington college is important to you, then you need to write a check." How much does the college need? "Well, you know, I haven’t set a fundraising goal yet so you know I’m hesitant to," Smith said, pausing for a moment. Then, leaning forward and gripping both sides of his red armchair, he continued, "You know what? I want a million dollars." That is, $1 million by June 2015, he clarified. Smith hasn't gotten much further than that. Other than focusing initially on individual donors in Chittenden County, he said, he hasn't had time to hammer out a fundraising plan. "The first thing I’m doing is talking to you and saying I need people to write checks ... We’re going to have to talk later about how to sort of follow it up." But he does have his pitch down. Smith repeated three times during a half-hour interview: "You need to write a check for $1,000, you need to write a check for $10,000, you need to write a check for $100,000 or you need to write a check for a million dollars." Borrowing more money — the college is at least $10.5 million in debt from the purchase of its lakeside campus in 2010 — is not an option, Smith added. How can he find people people willing to sink money into an institution that could be, well, sinking? Not shy about repeating himself, Smith shrugged off the question with one of his own. "They have to ask themselves this question: Is this institution important enough to save?" The second part of his plan, Smith said, is growing enrollment, which he described as more of a long-term endeavor. He wants to "professionalize" the admissions office. That will involve hiring people to actually go out and recruit students — something Smith said really hasn't been happening. "You don’t just build it and people come. You have to sort of seek people because there’s other institutions out there that are doing the same." Still on the "to-do" list: figuring out what types of students to target. Smith said the the admissions office needs to analyze its application data to figure that out. Before resigning, Plunkett signed a contract with an outside firm that specializes in consulting to higher education institutions on admissions, and as part of that contract, the college hired a new director of admissions. The college has lost a number of employees in recent months, including one of its admissions officers. The school's value, according to Smith, is that it appeals to nontraditional students. "But for Burlington College, many of the individuals wouldn’t be going to college," he said, "and that’s why I think it's important for people to realize why this institution is so needed and critical in this community."